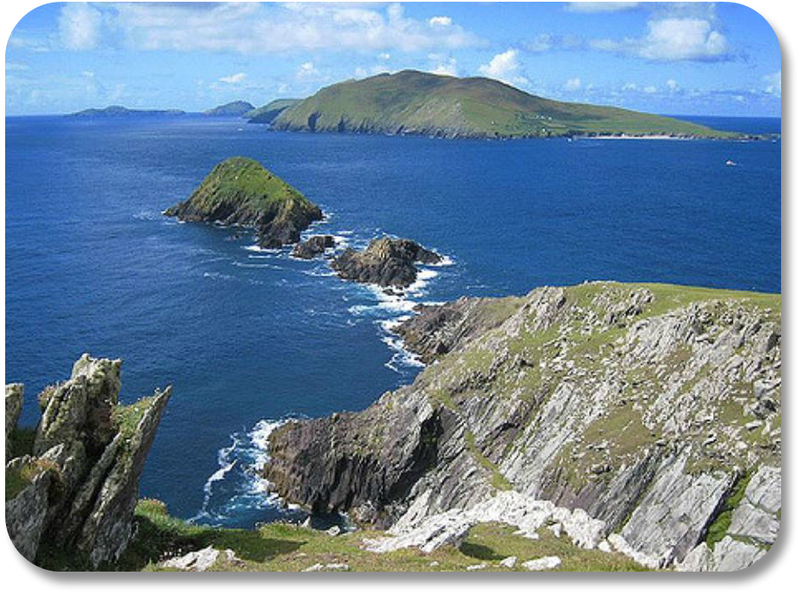 The Dingle Peninsula is the northernmost point in County Kerry, Ireland. The scenery is incredible, and the rugged cliffs of the Peninsula are known the world over. Stunning beaches allow for lots of outdoor recreation, and the area is a cultural hub with a large percentage of Irish speakers. Dingle Town stands out as one of the top places to visit on the Peninsula. The Peninsula is the southwest corner of Ireland, making it a nearly four-hour drive from Dublin along the M7. More frequent buses come from Tralee, which is just an hour's journey from Dingle Town. If you're heading to the Peninsula from Cork, the journey is just over two hours by car. While there are plenty of bus services in the area, having your own car makes it much easier to stop at vantage points and make the most of the fantastic scenery. Here are 10 fun facts about this amazing Irish landmark. Hopefully they will entice you to pay a visit in person! The best place to begin your trip is in Dingle Town. The town is home to about 1,500 human residents and one bottle-nose dolphin named Fungi, who resides in the harbor and is the town's unofficial mascot. You'll notice that the homes in Dingle Town are painted in colorful pastel shades. In the 1970s, Ireland held a nationwide Tidy Town competition, and Dingle residents embraced it by changing the color scheme of the whole town. The Dingle Peninsula is known for its fierce devotion to traditional Irish culture. Head to the Gaeltacht to experience a region where Irish is the primary language. The Gaeltacht is made up of several small villages, and at each you can get involved with the local culture and arts. You can read their traditional poetry or listen to Irish music in a truly unique and authentic setting. One of the Peninsula's most famous former residents is Tom Crean, an Antarctic explorer who hailed from the village of Annascaul. If you visit Annascaul today, swing by the South Pole Inn, a tavern once owned by the explorer himself. While it is known as the Dingle Peninsula, most locals refer to it as the Corca Dhuibhne. This refers to the túath people who lived in the region during the Middle Ages. If you're eager to enjoy spectacular views as you drive, then you won't want to miss Connor's Path. This narrow, twisting road is an elevated pass that darts through sheer cliffs and lakes. If you'd like your views with less of an adrenaline rush, then head to Inch Beach. This beach boasts three miles of gorgeous sandy coastline, and it is a popular spot for families. Surfing is one of the most popular sports on the Peninsula. While Inch Beach is fine for beginners, serious surfers will be found at Castlegregory, the site of many surfing competitions held throughout the year. If you've got a week or more to spend exploring the area, then nothing could be better that setting off on Dingle Way. This loop trail takes about eight days to complete on foot, but it will give you the best possible picture of the area, the culture and the breathtaking scenery along the way. I Enjoyed That! Where Can I Learn More? Great question! As you can see, exploring Ireland's amazing landmarks (either in person or online) is a fun way to enjoy an Irish experience and express your personal Irish side! For more information of this kind, check out our section on Ireland sightseeing here! In the meantime, if you enjoyed this page in particular, please take a moment to share your feedback about it, or any other part of our site. Simply send us an email using our contact form here.